This topic contains 39 replies, has 3 voices, and was last updated by hadenmaiden 9 months ago. 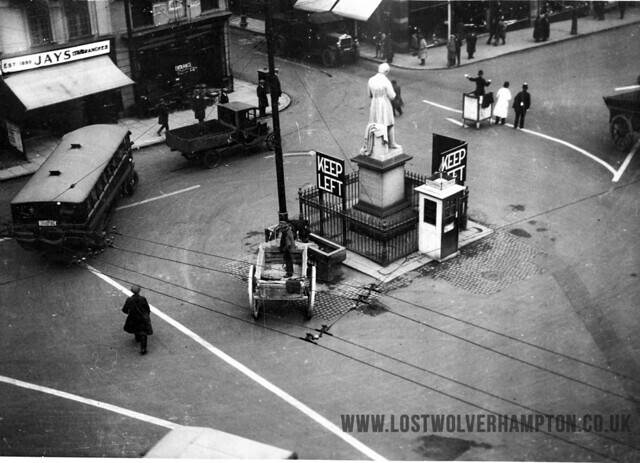 A Blog to help you find the answers and the missing pieces from past times in Old Wolverhampton. In answer to your query Bill, I’m away again beginning of February and in answer to your query Tony, “Where have all the ornate pieces from Wolverhampton gon” well this ornate piece is off to South Africa. Here’s your first query Bill. Talking to an old mate of mine on Saturday, two subjects came up. St. Johns Church and Sir Jack Hayward. My friend thought he could remember St. Johns asking for help when it was found that the stone facings needed replacing due to atmospheric pollution. According to my friend this was due to the heavy acidic fumes that came from the many brass foundries in the area in the 18th and 19th centuries apparently Sir. Jack supported the appeal as he did many others. Can anyone confirm this. It was a Hayward George but not “Sir Jack” in this case it was his Father. seen in the above photograph. 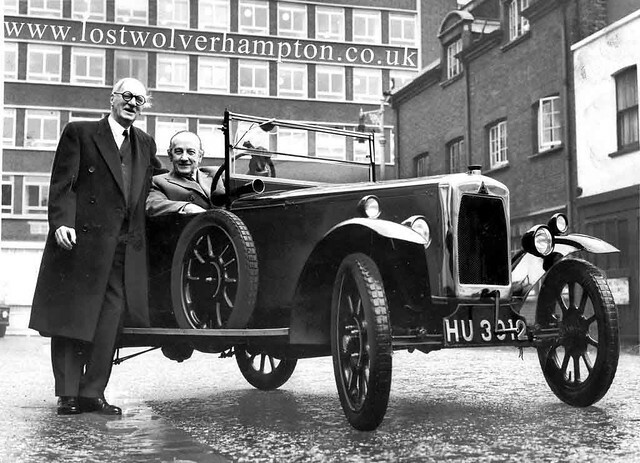 Mr Charles Hayward with millionaire industrialist John Sangster at the wheel of an Ariel car. “The Ariel was my baby”, he said. Although the body was built by Mr Hayward a sidecar manufacturer in the 1920′s. The church in the centre of John’s Square originally had Georgian houses all around it. Charles Hayward was a choirboy at the church in the early 1900′s and started in business in the area with a small cycle shop. He later became chairman of the Firth Cleveland Group.He was very generous to his native town and financed many schemes including most of the cost of replacing most of the stonework of St John’s Church. His son Jack (later Sir Jack) Hayward carry’s on with his good works the Molineux Stadium for example. 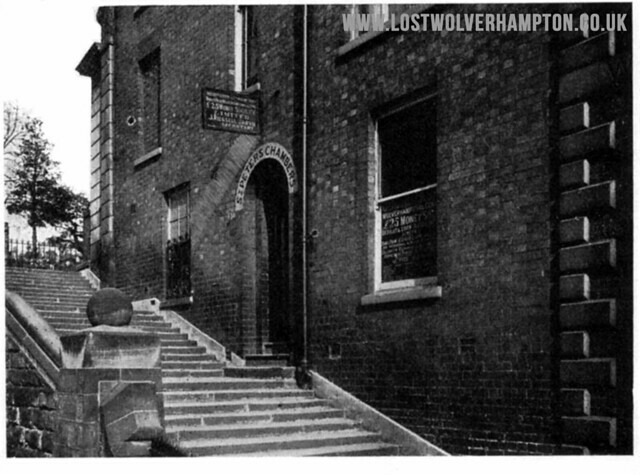 In answer to the Querie Posted on Facebook -Wolverhampton in old photographs by Frank Sharman. This is the exact location on Snow Hill late 1920’s. The Transport Cavalcade is negotiating the awkward turn with Pelham Villiers Statute on its left see (The youngsters perched on top of the telephone boxes adjacent to it),it appears to be proceeding down Cleveland Street, probably on route to the West Park. May be this is the corner shop. No 46 Red Cross Street Ms, Jean Fencott enquired about on Facebook January 21st 2015. Seated on the doorstep in the 1950’s is Mr Harry Wright ex, local Coal merchant showing the fine charactor of the wonderful man he was. It was the shop in the top picture then Jean No. 45a, and it was Smiths as I recall. Did some one call Lowndes share the property have some connection with the business at that time. I was at Red Cross Street School during and just after the War with a Graham Lowndes. Dave Hood enqired about Bill Prices Yard and the Blacksmith Percy Bates on Facebook January 22nd 2015. Percy Bates was the Blacksmith, who lived at No. 11 Camp Street Dave, and rented a portion of the yard of Bill Price in North Street. Your father was Derek Hood wasn’t he Dave you were born a few doors down from Danny Cohen a friend of my fathers. Nice block of houses those I recall on the North side of Camp Street. Yes you are correct the original site of the North Road Club was on the five ways at the bottom of North Road. 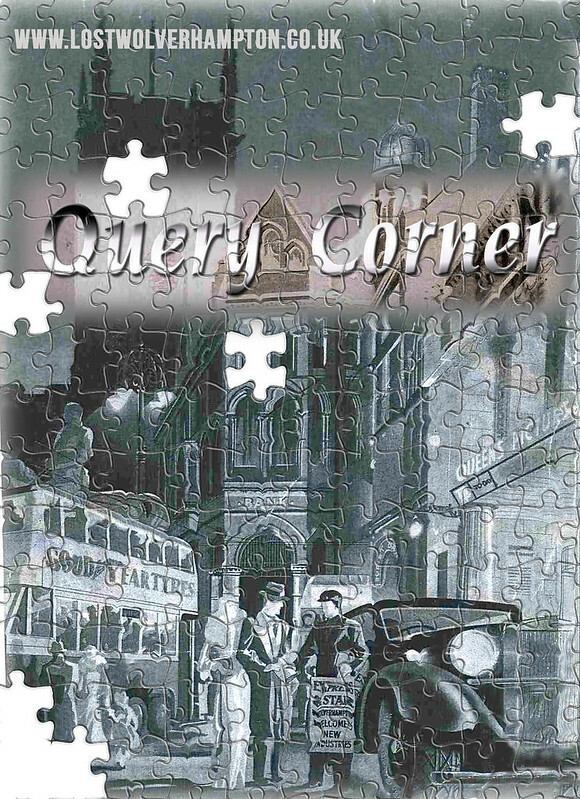 For Allan who is looking for information on lost Pubs in Wolverhampton. It was built in 1835, at a cost of about £7,000 given by the Rev. Wm, Dalton and his good wife presented the church with its organ. Is this the photograph you posted previously of the demolition of that grand old building Helena? On its demise in 1963-4, it was you could say, one of the first major casualties resulting from the building of Wolverhampton’s new ring-road. It wasn’t burnt down though an act of vandalism. It was just its time had come it was the era of Church redundancies, and it was also obstructing the widening of the Penn Road and Underpass. At the time of its demolition contractors wheren’t to much bothered then with reclamation so it was knock it down, burn the waste and get it done, and thats what we see here. And I must add the sadness of this occasion is written on the face of the demolition worker, as he notices the way the two burning joists have took on the appearance of a symbolic cross; I wonder what was going through his mind?. This little piece is for Freddie and likewise interested members. .A scene from 1948 of the site of what would become the new retail market, in 1960. Looking across from Brickkiln Street to Salop Street with Brick kiln Patch, long venue of Pat Collins Fair, and numerous Circus performances. This now large area of waste ground, once known as Brick Kiln Croft. was the result of slum clearance in the late 1930’s between Peel Street , Salop Street and Bennetts Fold. 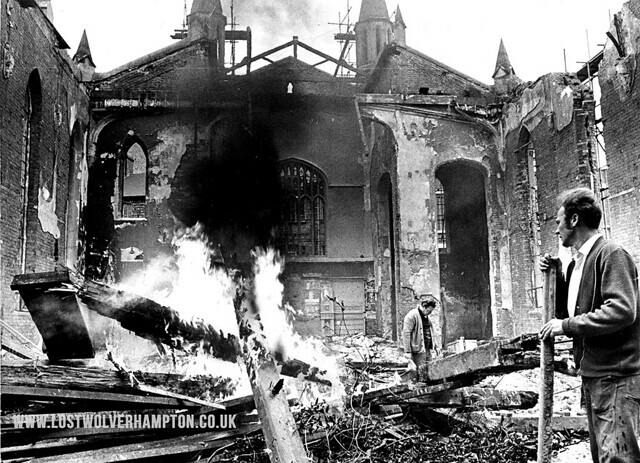 Wolverhampton had became a town of terror. The “Peel Street Monster” it said, was roaming the Brick kiln Street area attacking children, and it had sprang up and attempted to bite the throat of one pursuer. It was later eventually cornered and crushed with a brick. The would-be monster, was later identified as a coati-mundi, a raccoon type animal from South America, how it got to Wolverhampton is still a mystery. I thought you were going to talk about the old Wholesale Market. I dunno about rats as big as dogs but I’m sure you remember the little Banana Rooms which used to be behind the main market building. The banana rooms were little cell like rooms where the green bananas were hung to ripen before they were broken into “hands” and packed into the wooden Banana boxes which were lined with straw. The banana boxes were stacked in a corner of the yard until needed. There could be a 100 plus boxes stacked, each a nice quiet warm and cosy, dark residence suitable for the resident colony of rats who had a reliable source of their five a day a short walk across the yard. A tower block of rats. Every so often someone would decide that the crates needed moving, probably to the opposite corner of the yard and we would start by lifting the crates onto our shoulders. Then a rat would make a break for it, then another and another. Blokes shouting, kicking out, rats scuttling in all directions. Pure mayhem. If a rat headed towards you it would be a toss up who was the more frightened, you or the rat. After half an hour the banana boxes would have been moved and we could get back to whatever we had been doing and the rats could get back to the quiet well fed family life they enjoyed. Nowadays we would probably have more Health and Safety officers in attendance than rats. Yes George. I remember Thomas Dickenson’s, later Francis Nicholls Banana Rooms in the yard at the rear of the Old Wholesale Market in Wulfruna Street. Ours were down in Railway Drive where I spent many an unhappy, hour unloading the trucks of unripened bananas. Yes and over the years i recall the market residents being plagued by Rats, Mice, Pidgeons and the occasional big spiders. It takes me back to my youth when as a 15year old working for H.Goodall,in the said,market. I remember being first in the queue waiting outside the Market Cafe (then on the ground floor at the bottom of the market next door to Sam Hyde) For Fanny ?. to open up at 6.00am, to collect a jug of tea. Following her in to the cafe, I couldn’t help noticing the mice turds and the patterns their little feet had made in the fat contained in the huge frying pan on the Gas Stove. Consequently from then on Bacon Sandwiches were a no go for me from there!. 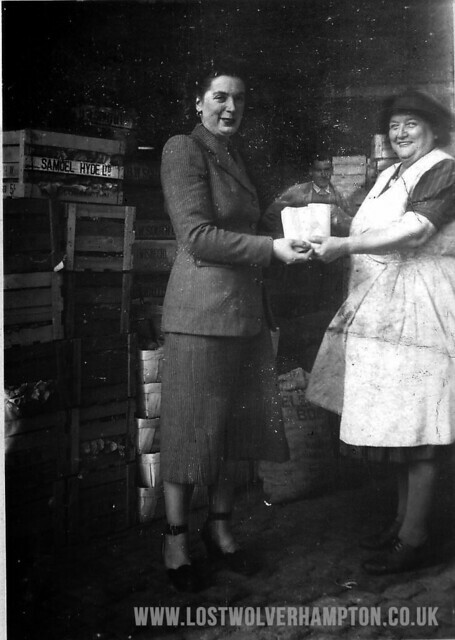 I have had this photograph many years It shows, If I remember right Fanny standing in front of the Cafe in the Wholesale Market, offering a bag of goodies to Mrs Warrender Whom I believed worked on one of the fish stalls in the retail market at that time. We were lucky Bill, Francis Nicholls had their own canteen. We used to chat up Dereck who ran the mushroom pitch to pinch a mushroom out of each basket to go with the eggs and bacon. Dereck was an amature magician and I bought his old Dinner Jacket. I’d love to say I found three pigeons and a rabbit sown in the lining but that would be stretching it a bit too far. Mind you, your story brings a new meaning to the pitter patter of tiny feet. WE HAVE THIS REQUEST REGARDING OLD NEWHAMPTON ROAD WEST. Hi Billy, was wondering if you could help? Recently an unknown distant relative contacted me, this was completely out of the blue. She is a distant cousin and was researching her family tree. She is related to me through my paternal grandmother Ellen (Nellie) Taylor, born Wolverhampton 1898, my paternal grandfather was Joseph Frederick Barlow, Joe was born in Wolverhampton in 1894. This distant cousin said that her mother reckoned that my Grandad, Joe Barlow, was related to the founders of Barlow Motors of Wolverhampton. Perhaps a brother or cousin of the founders. That’s the first I’d heard of it. Do you know anything of the history or founders of Barlow Motors? 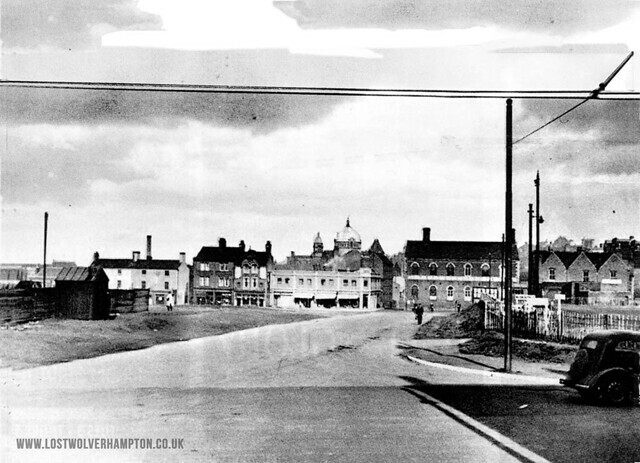 All I can say at present Terry is that they seemed to appear at 347, Newhampton Road around the mid 1950’s. They may have took on the original Motor sale business of Shacklock’s , who were situated at 347 Newhampton Road in between Gibbs Street and Hunter Street.prior to that date. LIKE HEINEKEN, LOSTWOLVERHAMPTON REACHES THE PARTS OTHER BEERS CAN NOT REACH. I’m sitting in a small Bar in a Town called Wilderness on the Indian Ocean. The sun is shining and the temperature in the low 80’s, I have a cold beer in front of me along with my IPad. I have already read the Daily Mail and The Telegraph. 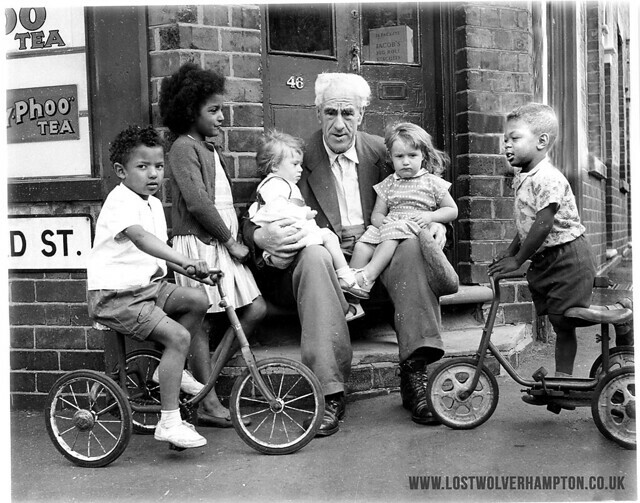 Preparing to call up lostwolverhampton as I do daily, I’m a little perturbed that there’s been nothing from Bill for a few days, particularly as I’ve posted a couple of items and always expect a comment. 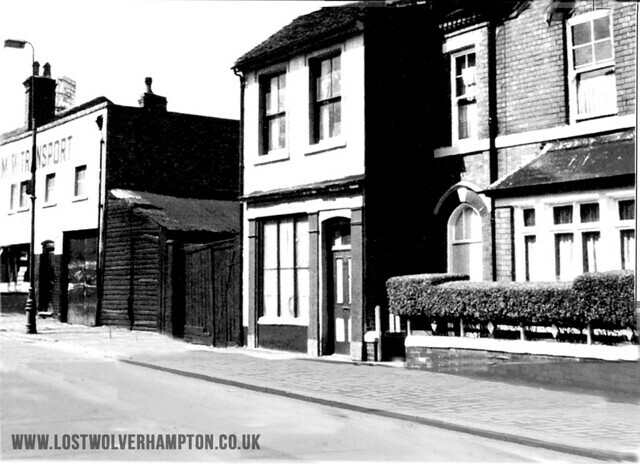 The Lostwolverhampton site comes up and Bill’s by-line appears, click on it and I am transported back a lifetime by a photograph of New Hampton Road, West. This was the view across the road from our house in 1947. Not only that but it was there I did one of the more stupid things of my youth. In those days most play things were mundane items that your imagination transformed, mine that day was a bamboo bean stick that was in my eyes a Gladiators spear. Cycling down the road were two young girls who lived close by and I performed the stupid act of casting my Gladiators spear along the ground. Of course, the spear/beanstick went through the front wheel of the bike, which stopped dead and the young lady flew over the handlebars to finish up a crumpled heap in the road. I ran. I know not where but retribution was both swift and merciless on my return home. 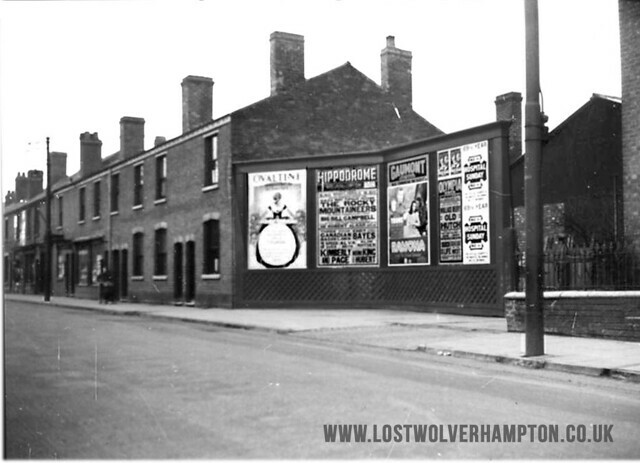 Speaking of the photograph the shed to the right of the advertisement hoarding is the entrance to the Wolverhampton Steam Laundry and was just across the road from Barlowes Garage. Bill, you are right in your facts. When I lived at 345 New Hampton Road, West, number 347 was Shacklocks Garage; I was friendly with the son, Tommy. We lived there from 1946 until 1951 and when we moved Shacklocks still owned the business. There was no showroom as I remember, just an entrance into the yard and next to that was another set of advertisement hoardings. There was a petrol pump that was hinged to swing over the pavement and the heads of any unfortunate passersby when serving petrol. Not much Health and Safety there. 343 New Hampton Road, West, was lived in by a family called Cox, who had a son my age. I remember his mother kept a cane, punishment for the use of, hanging from the picture rail, which we all had in those days. A picture rail that is. My mother didn’t need artificial aids when it came to punishment; back of the hand was good enough and it gave her the element of surprise. Looking at the picture, which I hadn’t seen before, you can pick out two shops, one was the Fish and Chip Shop, coal fired fryer, how did they control the temperature of the fat, and a Sweet Shop, which was run by a little old lady. I remember saving up with a friend, Reggy Thurgar, for when they stopped the rations on sweets. Never trust mates when it comes to sweets. I got done. Housing on that side of the Laundry were, as you can see, two up, two down terraces, the other side were the more substantial terraced villas with small front gardens behind a low wall or privet hedge. As a movie buff I’m surprised you haven’t filled us in on the Adverts, Bill. The first one is for Ovaltine but we were committed BournVita drinkers over the road in No. 345. The next is for the Hippodrome, top of the bill being Big Bill Campbell and the Rocky Mountaineers. My Granny took me to see them at the Hippodrome in 1946/7. A sort of poor man’s Roy Rogers and Gene Autrey, who were the Silver Screens Singing Cowboys. The Gaumont is advertising Ramona, a drama starring Loretta Young and Don Ameche, while the Olympia is showing Old Hutch with Wallace Beery as the main character. I seem to remember Noah Beery Jnr., his nephew playing opposite James Garner in the Rockford Files. I think the photograph could be a bit earlier than the 40’s as IMDB date both films as being produced in 1936, even allowing for the war four years seems to be a bit long for the films to cross the Atlantic. The last set of ads have got me lost though, perhaps someone can throw some light on them. Both ads are headlined Hospital Sunday. The Net tells me that it was some form of fundraising for the Hospitals, remember this was prior to the NHS but does anyone know any more. Well done George another amazing story of the likes we have come to expect from you. I am sure Terry will be pleased to know the exact location of Barlow’s garage and I am grateful myself for the added information of the photograph as I was only vaguely sure about the location. I hope you and Pat are have the very best of breaks, again you are a scholar. 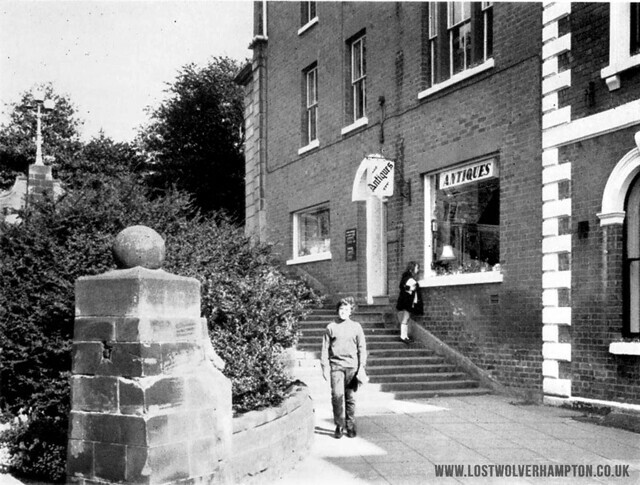 Trevor a man with a passion for recalling old Wolverhampton asks on facebook Wolverhampton Past & Present Does anyone remember the Antique shop at the Top of St Peters steps, in the corner or am I mistaken. I think it later became a solicitors now the Lych gate tavern. Yes Trevor I remember the Antique Dealers on the side of the steps, leading from Exchange Street up to Lich Gate. 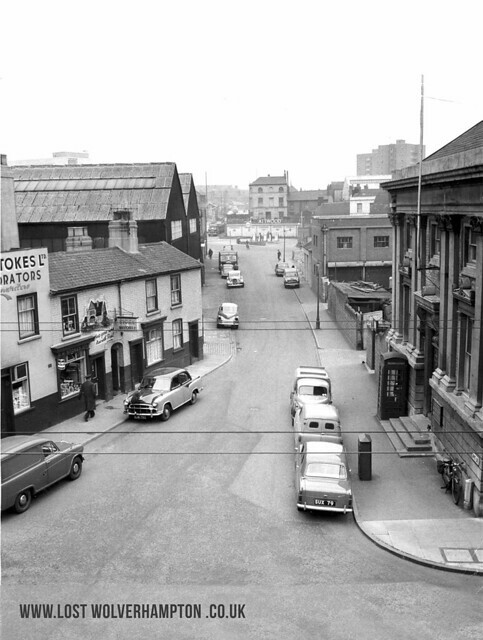 There were many businesses located in those premises over the years, Hairdressing Suplies, a Building Society, an Optician’s, I think in the early 1960’s he introduced the new style contact lense in town. The Antique dealer who probably followed him into that store late 1960’s was Mr H.A. 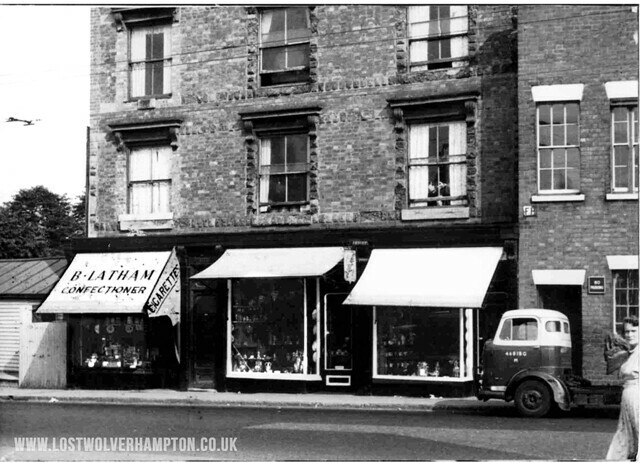 M. Lasance who had another store prior to this in North Street opposite the Molineux Hotel. Pre-war picture of the frontage the window was enlarged after the war. Wonderful spot for an Antique business.here on the steps at the side of the Collegiate Church. This is how you would recall the Antique Shop, circa 1970. With that larger fine window. The Antique Shop at the top of St. Peter’s Steps. I’ve got a small mahogany desk my mother brought Pat and I from there, back in 1964 as a wedding present. It was repro but a nice piece and now sits in the lounge supporting the laptop. I asked if it was antique. Mothers reply was, well, “He said it was made from old wood.” I wish I could add more to the subject but although I would look in the window that was as far as it went. I remember this business best When it was in North Street, a double fronted shop a former Butchers at No’s 26-28 A loveley continental couple ran it. I brought Marcia my wife a silver bangle from there when we got engaged in 1954. She still has it. One or two older Wulfrunians may recall Tommy Butler a Turf Accountant opening a new business,in the vacated Antique shop in the early 1960’s. George will probably recall the betting office working around the corner in the Wholesale Market at that time. I’d better finish the story and tell you of the next time I stood on stage in front of the whole school. I had managed to damage one of the brand new desks that had only been delivered the previous morning. truth be told I had knocked a ruddy great chunk out of it with a pellet gun. My sentence, proclaimed by the Head Master, Mr. Jackson but carried out by the Deputy, Mr. Clinton, the first time I came across the Bad Cop, Good Cop routine, was six of the best, bent over, in view of all the pupils and Masters. Several sayings come to mind, “Spare the rod, spoil the child.” “This is going to hurt me more than it will hurt you.” What I did remember was “Don’t tell your father when you get home or you’ll get it again. But I was so hoping the time of your good fortune, would have been some ten years later. 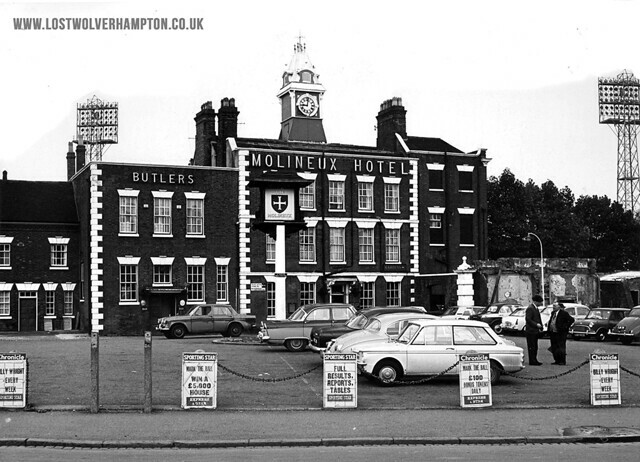 Because I have this photograph taken from outside the Antique Shop then Betting Office, of the proprietor Tommy Butler in conversation with a punter on the forecourt of the Molineux Hotel. Art Street; so named because of the Grecian Doric building seen on the right, on the corner of Darlington Street built in the 1850’s to house the School of Art and Design. Built specially in 1857 to become the final home of the Subscription Library,here in Waterloo Road and there it remained until the 1920’s. when the library became redundant. 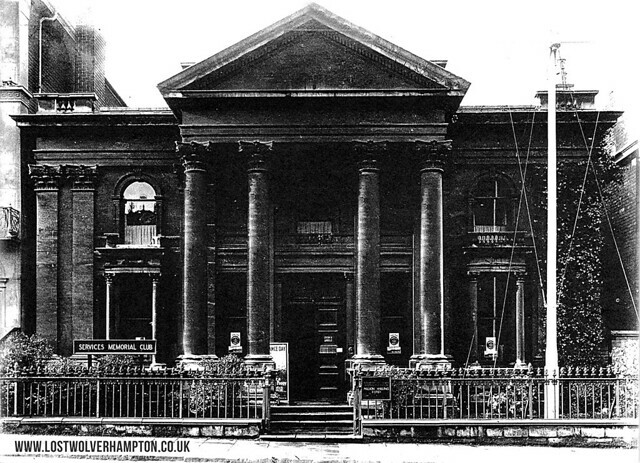 This building was then acquired by the Services Memorial Club seen here as a club for the ex-servicemen, and finally in the 1960’s it was sold and demolished and became just one of many fine Victorian buildings lost to the the town in that decade. I knew Art Street and the College. It was 1956/7 I was working at the Express and Star as an aprentice compositor on a day release course at the main College. Part of the course was a six month period on bookbinding, don’t ask me what this had to do with Newspaper production, but it was part of the course. I enjoyed it and we actually got round to binding a couple of books. Half bound in leather with marbled edges and gold blocked titles. Wish I still had them. Why I’m writing though is I’m just reading a book, Pompeii, by Robert Harris, who also wrote Fatherland, Enigma and Archangel. With a title of Pompeii it’s a pretty safe bet that the contents are about the fate of that ancient city and the destruction of the the many Greek and Roman temples. Looking at your last couple of pictures, Wolverhampton Council haven’t done too badly in the destruction and razing of classical architecture, and all in the name of progress. Bill, I knew Art Street and the College. It was 1956/7 I was working at the Express and Star as an aprentice compositor on a day release course at the main College. Part of the course was a six month period on bookbinding, don’t ask me what this had to do with Newspaper production, but it was part of the course. I enjoyed it and we actually got round to binding a couple of books. Half bound in leather with marbled edges and gold blocked titles. Wish I still had them. Why I’m writing though is I’m just reading a book, Pompeii, by Robert Harris, who also wrote Fatherland, Enigma and Archangel. With a title of Pompeii it’s a pretty safe bet that the contents are about the fate of that ancient city and the destruction of the the many Greek and Roman temples. Looking at your last couple of pictures, Wolverhampton Council haven’t done too badly in the destruction and razing of classical architecture, and all in the name of progress. My last story was so good, that as in New York, New York, So Good They Named It Twice, I had to put it in twice. Your story of Tommy Butler, is he the little guy, on the right. It must be 60 years now since I saw him. I seem to remember him having an office, before Betting Shops were made legal in Dudley Street or Queen Street. The bit I like is the Express and Star ad, win a £5000 house. From the cars on show, Singer Gazelle, Hillman Imp, the Mini, a Ford Zodiac what looks like an Austin Sprite the year would have been about 1962. That must have been some house. I bought my first, brand new, in Kidderminster in 64, a two bed dormer bungalow for £3650. £365 deposit, the mortgage was about £60 a month and we thought we would never be able to afford it. We did, then the interest rates went up to about 15%. And we thought we’d never afford that, but we did. People think times are hard now, times were hard then, you just buckled down and worked at it. 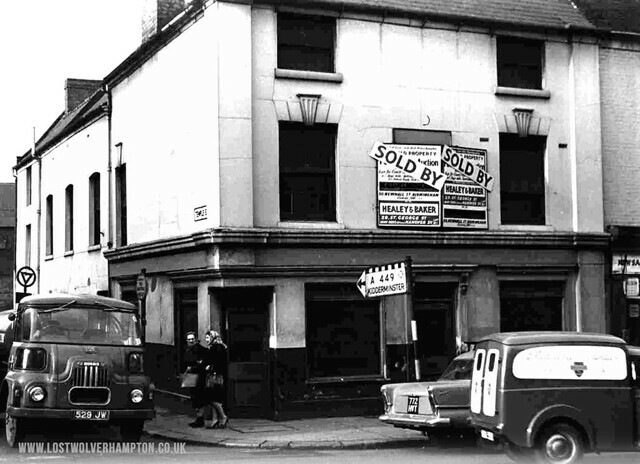 You are correct George Tommy Butler had his Turf Accountants office in Queen Street above Samuels Jewellers, long before Betting was legalised You are about right with the date of the Molineux Hotel picture it would have been circa 1962. Paul Bennett . Webmaster of Wolverhampton Family History Group on Facebook. requested a look at the plan of the area between North Street and Stafford Street in 1870’s Known locally as Four Ashes. The reason being his his grandads brother married into an Irish family name of McDermott lived in that area. My reply to Paul is this quite a lot of Irish family’s settled in that area in the 1850’s onward my forebears the Egans Who settled in Lawyers Field. It may be a coincidence but my Grandmothers sister Margaret married a McDermott in the late 1800’s. John Joseph McDermot was living at No. 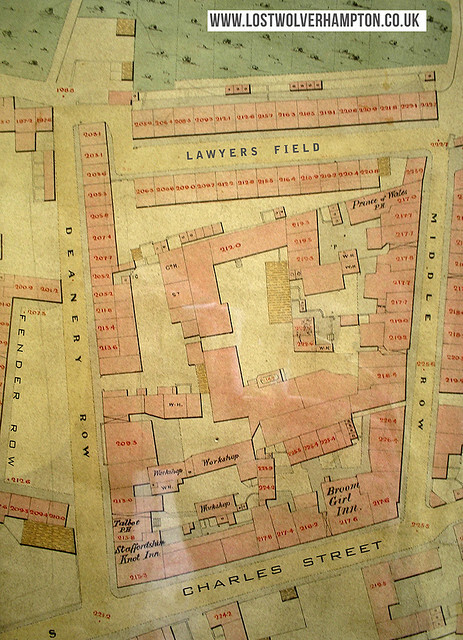 15 Lawyers Field in the house vacated by my Grandfather and Grandmother who moved to Nursery Street close by. My reply to Paul is this quite a lot of Irish family’s settled in that area in the 1850’s onward my own forebears the Egans settled in Lawyers Field. at that time.